As our population grows our roads become busier, posing increased threat to farmers and their livestock as they herd cattle across busy roads up to four times per day. Farmers face a continual struggle to protect their own safety as well as the safety of their livestock. Apart from safety (being the most important aspect), crossing busy roads with cattle is incredibly inconvenient and time consuming. 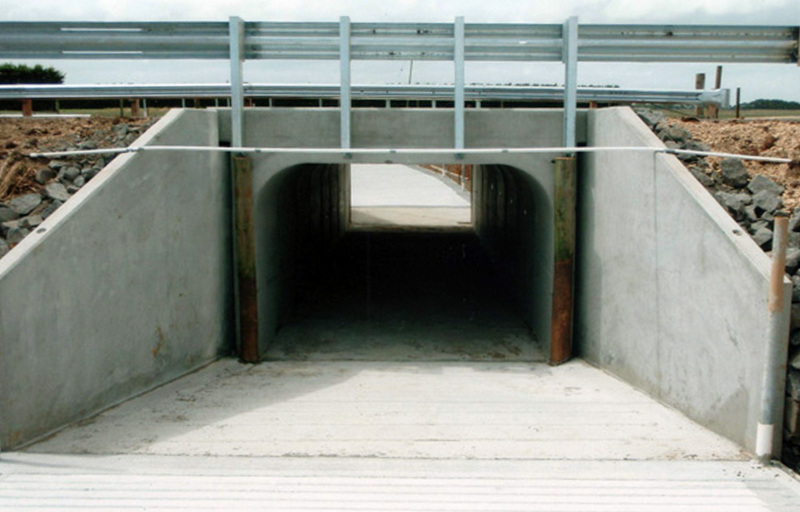 The best way to reduce risk, time and inconvenience is with the installation of a cattle underpass. Our cattle underpasses provide farmers in Geelong and rural areas across Victoria with a safe and efficient solution to move cattle between land divided by roads. Cattle can pass safely and unmanned under roads, eliminating risks to both livestock and people. Pedestrian underpasses and walkways are ideal solutions to protect the safety of people requiring access to specific locations near busy roads, eliminating the risk of injury via road crossings. Pedestrian underpasses work well in many scenarios, such as access to carparks and popular tourist attractions. Railroad crossings are among other scenarios where pedestrian underpasses (or overpasses) are a solution to managing risk. Otway Precast also specialises in prefabricated equipment shelters, underground storage and bridges in Geelong.